Building your pool should not be a puzzle ! You should think everything through before taking the first step. You need to know: the shape of your pool (oval, rectangle…), the shape of your edges, its size, the materials that you wan to use, the type of liner that you want to use (concrete, tiled …). Where should I build my pool ? During the planning period, make sure to correctly position your pool (before its construction or installation), according to the prevailing wind. So that filtration can be effective, it is best to place the skimmer facing the wind. Thus, the wind takes the water in the right direction to be filtered. Finally, the backflow will be into the wind. Essentially, if a pool is exposed to winds in the wrong direction, it can make filtration difficult or even impossible. When is the best time to start construction ? The best time to start building your pool is in winter. That is to say, at a time when you can plan everything out and are not rushed, in case the construction takes more time than expected. First of all, you need to prepare the ground : mark out the place (check that nothing is in the ground and balance out the slope if it is not flat enough). Digging allows you to mark out the placement and the depth of your pool, and to map out all of the routes that will connect your pool to the control room or the house. To set up the drainage you have to put drains around the pool or at its base, to divert the flow water which can put pressure on the pool. The presence of groundwater, clay soil or a slope makes drainage indispensable. Next comes the building of your pool’s structure. 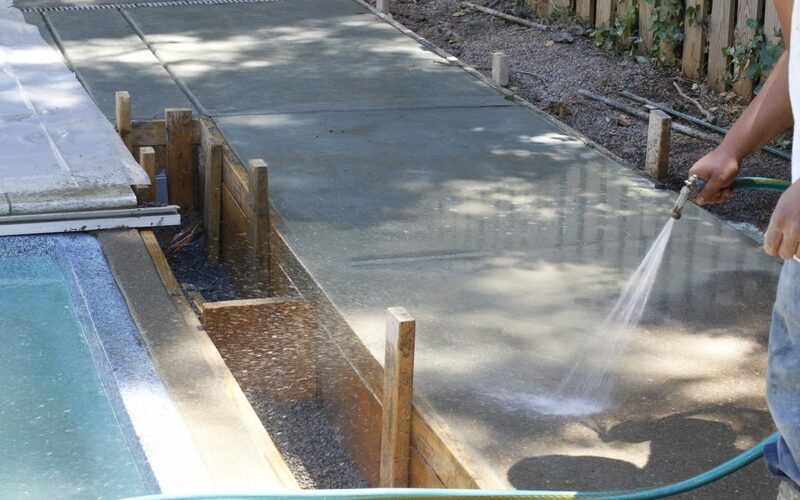 There are several types, for example, even a concrete pool can be built using different techniques (cast-concrete, sprayed concrete, reinforced concrete, concrete casing). The choice can also depend on the shape of pool that you want. Some pool manufacturers design panels to simply fit together and build the walls of your pool. The materials used can vary greatly. If not this, you can fit a polyester shell to your pool, built in a factory and delivered to your home during the works. Placing your shell, as always, requires knowledge. It is time to set up and think about your control room and the equipment that you want to put there. There is your filtration system, an outdoor power source (plug sockets)… Make sure to plan this carefully to conform with safety regulations. After having dug up the ground, it is time to refill all of your little installations. Fill in the holes and replace the ground around the pool. You are almost there ! Then there is the question of lining, once your structure is watertight. It is up to you to choose according to your taste : put in tiles or a mosaic, put in a liner (you will need to follow certain steps whilst you are installing it). Now, put in the water, your pool will fill up, bit by bit and therefore give you the time to rearrange the area around your pool (lawn, gravel, trees, garden furniture..). Decorate how you want! Once everything is finished, make sure to properly test all of your equipment (filtration system…) And now you can enjoy the sun-filled days. I am ICO, your connected device, which measures, anticipates and adapts its advice and lets you know on your smartphone. Whatever type or shape of pool you have, I don’t interrupt swimmers and make myself discreet to let you know the water quality in your pool.